Playing Rugby offers numerous opportunities to a healthy, fun, and committed lifestyle. It can also lead to new challenges, experiences, and travels around the world! Playing Rugby offers numerous opportunities to a healthy, fun, and committed lifestyle! Rugby is an exciting and energetic sport that involves physical activity, discipline, and concentration. By regularly attending trainings and games, children are challenged to keep high energy levels, stay active, and learn how fuel their bodies to build mental and physical strength. Rugby is the most inclusive sport as, unlikely many other team sports, it accepts all body shapes, sizes, and weight. With 15 players on the field at one time, there is a wide range of positions and each one comes with different requirements, allowing all body types and personalities to be suited for a specific position on the field. Everyone feels important on the pitch, and as a result off the field too! Feeling accepted and needed by peers and teammates from an early age and through adolescence, plays an important role in boosting self-confidence. Kids that train and play together, bond and make instant friends. We often say that friends made on the field stay friends for life. Learning how the improvement of the individual can benefit the whole team, sharing thrilling wins as well as tough losses, fighting together for a common objective, unites teammates. At the Clan we believe that differences in body type, abilities, thinking and cultures teach our kids to respect, appreciate, and embrace diversity without hostility or conflict. Our teams are stronger because they are diverse. Part of Rugby culture is respecting your opponents on and off the field, and bonding with the opposite teams after games and at events over hot dogs and hamburgers. “United in diversity by the love of Rugby” is one of our core values. At the Clan you don’t belong to a rugby team, you belong to a rugby family. With so much to be shared on and off the field throughout different ages and stages of life, kids feel accepted and looked after by their Rugby club as by their own family. It takes more than players and coaches to make a rugby club, and with 17 different teams, 40 coaches, an executive board, a host of ‘old boys’ (past players still involved in the club), a team of sports professionals, and an army of parent and player volunteers, we are a community that becomes part of everyday life offering acceptance, support, and positive competition. As all families, we share meals too! Every Friday night after practice, we have a BBQ for our Junior players - just to make sure they recharge their batteries after a good session of hard work. Rugby is a global game, and it is a great way to see to world. Many players decide to go for an international experience by doing an exchange with a Club in a foreign country, improve their skills, make new friends and connections, be challenged by change and adaptation, and learn from other cultures and countries. Travelling through Rugby means landing in a new place, and from Day 1 being able to count on a solid, welcoming, and caring community. As a well-established Rugby Club, celebrating 50 years of rugby, we have helped many of our young players look for enriching experiences throughout Canada and abroad. Rugby also allows those who want to pursue a professional career to travel around the globe, and get to see the world while playing, coaching, or refereeing. At the Clan, we strive to share the love of Rugby and contribute to the well-being of our local community. Sock collections, and other needed items for the less fortunate in town, we try to contribute as much as we can. Parents and children are always welcome and encouraged to volunteer, and help us make a difference! Rugby is cheap to play, all you need are cleats and a mouth guard! There is no special equipment, no additional skills sessions or facility rental fees associated with rugby. Jerseys are supplied by the club and the Clan even has a cleat exchange program to gear swap to allow younger children to inherit equipment from older kids who cannot fit in them anymore. Navy blue socks and black shorts of any label are accepted. However, branded Clansmen socks and shorts can be purchased at the Clubhouse, respectively for $10 and $20 each. Registration fees for the year are considerably low. They are about $150 for ages 5 – 11, and about $200 for ages 12-18 for the season. 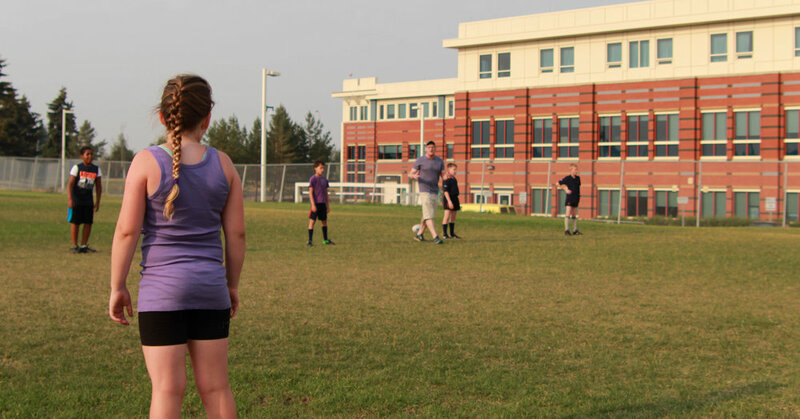 Trainings run for 2 hours/week from May to July, with game tournaments in Edmonton, Red Deer and Calgary. Note: specific time and dates of training and games vary for each team.